Microsoft's 'Surface': The Early Reviews Are In : The Two-Way And most reviewers seem impressed with their early interactions with the tablet. Microsoft announced yesterday that it was jumping into the tablet market with "Surface." That foray has been hotly anticipated and analysts believe with sales of PCs falling, it's an important move for the company known more for its software than its hardware. "No battery life estimates. No hard pricing details. No RAM figures. No CPU / GPU clock speeds. No resolution details on the Windows RT model. A maximum of 128GB on the Windows 8 Pro model (sorry, I need more space than that for a full-fledged PC operating system). And if the Win8 Pro edition costs as much as an Ultrabook... I'm just going to buy an Ultrabook." 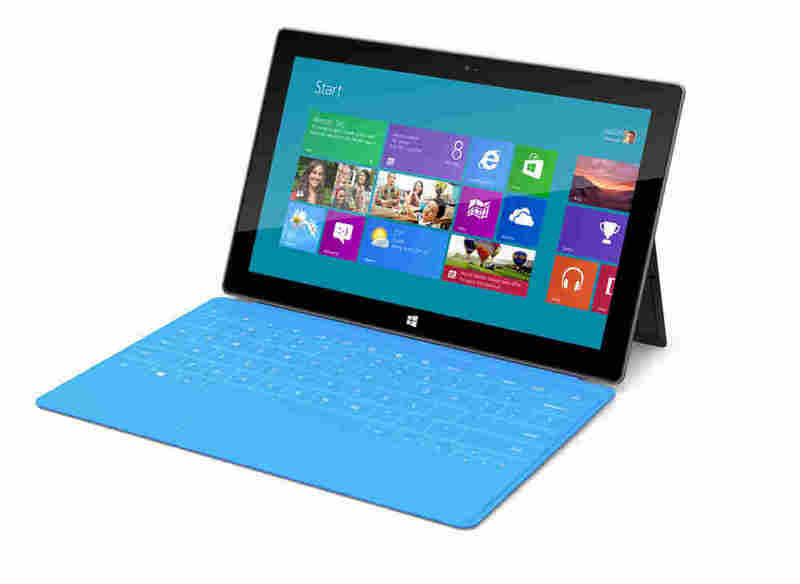 "The keyboards embedded in the two covers are, to me, the secret sauce with the new Surface tablets. They are the same size; both covers work on the Windows RT and the Windows 8 Pro tablets. However, they have definite differences. The flat Touch Cover has keys with no travel, but it had a good tactile feel, almost like soft cloth. The Type Cover has keys that have some travel; they were of the right size and spacing, and offered the right amount of resistance. It felt like a typical keyboard on a laptop, with a little more friction than the slick keys on an iPad, and it provides resistance for touch typing. However, I didn't have time for a full typing evaluation." -- The Verge's Dieter Bohn reports that Surface feels "incredibly well designed." He goes on to say that he likes the "Type Cover" but if "you were expecting any software surprises, we have yet to find them." "Microsoft's event today was long on promise and short on specs. RAM? We dunno. Processor speed? We dunno. Price? We dunno. Release date? We dunno. But even avery brief hands-on made something abundantly clear: It's a super solid device and if Microsoft can deliver what it demoed, the iPad finally has a real competitor and Android has a big ... problem." "My hands-on time with the Microsoft Surface was limited, but it made a very good first impression. Microsoft has put other tablet makers on notice." "Well, Microsoft didn't let me spend nearly enough time with its Surface tablets to write a comprehensive review and since the devices are still a long way from being released, I'm going to assume that's because Microsoft is still putting a lot of finishing touches on them. But what I saw looked really intriguing, and Microsoft has at least in concept created a tablet computer that can also double as a PC. While this alone certainly won't be enough to help Microsoft compete with the mighty Apple iPad, it does breathe some much-needed life into Microsoft's mobile product line." -- PC Advisor compared what we know of the Surface to the iPad and found that it is heftier, with a lower resolution screen but it eclipses the iPad in storage space.